Karim supports the design and implementation of information and communication technology (ICT)-focused programming. At the Center for Digital Acceleration, he helps projects think strategically, critically, and practically about using technology to improve lives, serving as a facilitator between the social and the technical spheres of development work. His support for projects has ranged from crafting multiyear strategies for developing and leveraging locally appropriate ICT solutions for women’s rights advocacy in Afghanistan to conducting user research on mobile money readiness in Haiti. He also supports projects in restructuring, digitizing, and automating their data collection, management, and reporting processes by designing custom data models and management plans. And he has led numerous trainings for project staff, donor clients, and others on aspects of digital development. Previously, Karim worked internationally as a scientific researcher, automotive engineer, digital media producer, and innovation programming officer, among other roles. 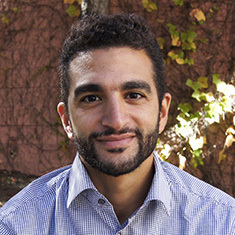 Karim also serves as Director of Operations for SkillLab, a social technology venture supporting the integration of refugees into local labor markets through digital skills assessments. Trevor’s eclectic professional background encompasses technology, electro-mechanical engineering, software development, data analytics, and musical performance.